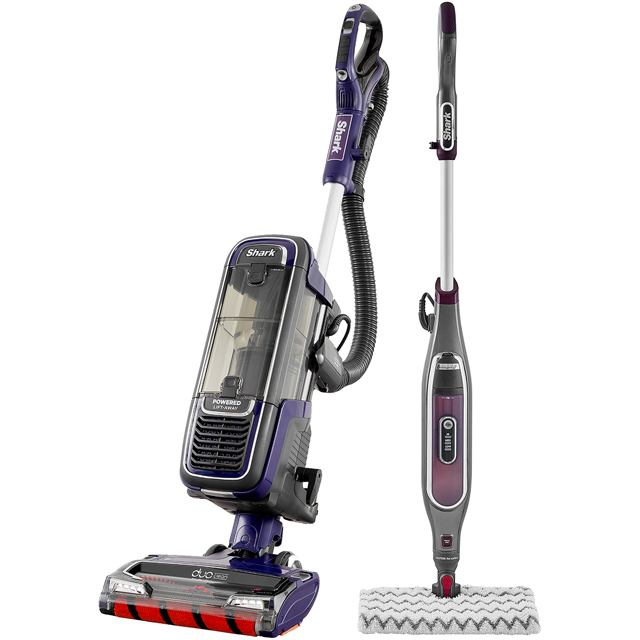 This Shark vacuum cleaner and steam mop bundle has everything you need to leave your floors spotless. The bagless vacuum has clever DuoClean technology, which uses a double brush design to tackle all types of debris across carpets and hard flooring. There’s a motorised pet tool too, which picks up any embedded dirt and fluff left behind by your furry friends. When it comes to cleaning your vinyl or tiles, the mop’s Klik n’ Flip Technology lets you clean twice as much in one go – just flip the head and you can easily use the other side of the dirt pad. They’re reusable too, so just pop them in the washing machine when you’re done, and you’ll be ready to go again. The vacuum picked up really well and I was impressed with how it performed on the carpets. The stair tool is really handy and helps you to get a good clean and the size of the hand tool means you can get into tricky corners. The cord is long enough to tackle a good sized room. You don't have to faff around unplugging it and plugging it in again. The drum is easy to empty and coped with dog hair really well. But it is heavy and quite hard to manoeuvre, if you are looking for a lightweight vacuum then this might be too heavy for you. The mop was a dream to use and also had a lovely long cord making it easy to do a big room. The pad is also a good size, so can do a large area fairly quickly. The downside of the large pad is that sometimes it is hard to get into trickier areas. Loved the way you can remove the pad without having to touch it - lovely little feature. On balance I have scored the bundle a 4 out of 5. Both of the machines do a good job but there are a couple of issues (the weight of the vacuum and not being able to get into smaller areas with the mop) that were frustrating. With regards to service and delivery. AO were outstanding, very fast delivery and the drivers were very professional, calling me to let me know when it would arrive and bringing it directly into the house for me as the contents were quite heavy! With regards to the product, I am a huge fan of the Shark hoover products. So I had no doubt that this one would be even more amazing! I would say that this is probably the heaviest of the shark hoovers as there are many different factors to this product- more rotating rollers. However even so, I’m not a heavy lifter and am perfectly capable of carrying it up and down the stairs! It’s a nimble product and I would highly recommend! The steam mop I had been after for some time, we have newly tiled our bathroom and they were in serious need of some cleaning! And boy did they bring the tiles back to life, as dust had gathered on them during our renovation! This mop also has a setting for laminate, so I had a go on our laminate too!! It did a marvellous job in this too! Highly recommend!!! * S6003AX950UKT_GYRG was at the higher price between 11/03/2019 and 10/04/2019.